It was 22:00 hours and suddenly the sweet tooth in me started to crave for fondant au chocolat. Since it was so late all the boulangers and supermarkets were closed.The only way now to quench my desire was to bake one myself. I went to the pantry to see whether I had all the necessary ingredients or not. As I am a chocolate lover I usually buy all the necessary things for baking before they finish off. To my delight I found all the necessary ingredients. I ran to Mitra with a smile on my face and told him about by baking plans. He was a bit surprised but started smiling as he too would get a share from it. I took out my big yellow tumbler, mug and a fork. Next I took out two medium sized eggs and butter (25 g) from the refrigerator.Then i took out my Lindts 70% coco chocolate bar (4 cubes), flour (15g) and sugar powder (25g). The trick to good baking is a pinch of salt and a drop of vanilla essence. All the ingredients were lying beautifully on my dinning table to be mixed together. I started with whisking the eggs nicely. I added a pinch of salt and a drop of vanilla essence to it. Next I added the sugar and started to cream it nicely with the egg. In the meantime I melted the buttter and chocolate in the microwave for 30 secs. I shifted the flour and started to fold it into the egg and sugar mixture. Next I added the buttery chocolately mixture to the mug.Then I gave it a good whisk. Now it was time to pour it into the ramekin. I greased the ramekin with butter and flour nicely.Then I poured the mixture into it and put it in the pre-heated oven (180°). 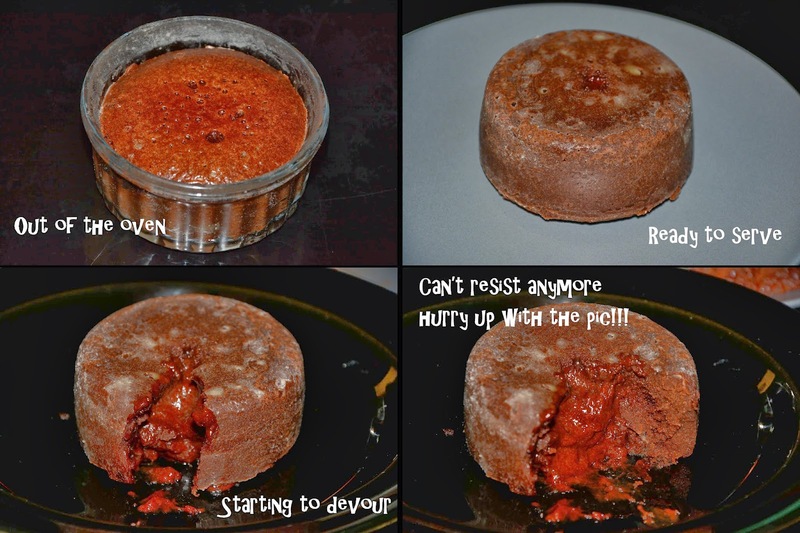 After 15 minutes my fondant au chocolat was ready. I let it cool a bit and then I inverted it onto a dessert plate. P.S. The time in the oven is very important. If it stays longer than required, the semi-solid chocolate core will harden. Then it becomes another French dish called Moelleux au Chocolat which is similar to a little delicious chocolate cake. Mitra started to click pictures but I could not wait to devour the tempting little thing. Without wasting any further moments, I started to dig into it. Voila, that was enough for Mitra to stop clicking and he promptly joined me in gobbling up the delicacy named Fondant au Chocolat.